It was a telling moment when China’s President Xi Jinping rose on January 16, 2017, to proclaim himself the new champion of free trade in the great conference hall of Davos, Switzerland, the citadel of globalization. This proclamation came just four days before the inauguration of the newly elected U.S. president, who has traditionally served as the leader of the globalization movement. The symbolism was rich. As a result of comments by President Donald Trump that his new administration might take a tougher line on trade policy than all U.S. administrations since World War II, the Davos crowd was uneasy. The elite gathering of global billionaires, celebrities, scholars, bankers, heavyweight pundits, CEOs, and upwardly mobile government officials cheered as the leader of the Chinese Communist Party promised to take over from an apparently faltering United States and lead each Davos Man into the glorious nirvana of ultimate globalization. Xi’s remarks reassured them that with China, at least, it would be business as usual and that their lifestyles would be safe. Yet, for the Americans who had elected Trump, and even for those who had voted against him but who had supported Senator Bernie Sanders, this business as usual was precisely the problem. And no leader symbolized this better than Xi. Here was the newly anointed “core leader” of the Chinese Communist Party appointing himself captain of the globalization team. But what is his approach to globalization? Xi’s approach starts with a state-controlled and censored Internet. It means banning companies that offer freedom of information, like Google and Facebook, from the Chinese market. It means strict controls on foreign investment in China while Chinese corporations go on shopping sprees in the rest of the world. It means that, in order to enter the Chinese market, foreign companies are required to invest in China, to export from China, and to transfer technology to China. It means that the exchange rate of the Chinese yuan is managed by the government, not freely determined by the currency markets like the euro and the U.S. dollar. It means investment subsidies for a broad range of key Chinese manufacturers and exporters. It means warnings of possible problems for Samsung’s business in China if the South Korean government obtains an American anti-missile defense system. In short, it means nationalistic mercantilism. This is what the masters of the universe in Davos were actually embracing. But it is precisely this kind of mercantilism that the post–World War II founders of the global trading system had sought to avoid. It is the ongoing lack of success in the battle against mercantilism that has created the constant gap between the promises and the results produced by generations of American trade negotiators. And it was to respond to this gap that American voters just elected Donald Trump to the presidency. Although none of these points were included in any of the pundits’ dispatches from Davos, historians looking back from the future might well identify this moment—when the world elite embraced Chinese-style mercantilism—as the moment when the era of the liberal free trade movement finally ended. The free trade movement was, of course, rooted in the pre–World War II turmoil of stock market crashes, wartime debt hangovers, depression, mercantilist currency devaluations, and tariff increases. The establishment of a system to prevent a replay of this 1930s mercantilism began in 1944 at Bretton Woods, New Hampshire. To avert competitive currency devaluations, a system of fixed exchange rates was established with all other currencies valued to the dollar at a set rate and with the dollar valued at a set rate to gold. To avert financial crises, capital markets were essentially closed. And to avert protectionism, a doctrine of free trade was established along with a system for negotiation of continual reductions in tariffs and trade barriers and for the adjudication of disputes. The goal of Bretton Woods was for the trade system’s members to remain in rough balance. Indeed, the International Monetary Fund (IMF) was created to provide emergency financing and rescue plans for countries that might find themselves with large trade deficits and inadequate reserves of dollars and gold. At the time, the British representative to the discussions, John Maynard Keynes, argued forcefully that in addition to loans for deficit countries, the IMF should also be empowered to impose tariffs on the exports of countries with large, chronic trade surpluses. As the country with the then-largest surpluses, the United States was not receptive to this proposal, and it was not formally adopted. But it was expected that the member countries of the trading system would maintain roughly balanced trade accounts. Otherwise, trade-related unemployment might become a problem. It all worked splendidly for about twenty years, during which time the United States enjoyed its greatest ever economic boom. This period also encompassed the German and Japanese economic miracles. By the late 1960s, however, the system was seriously out of balance. The exchange rates fixed in 1948 had not been changed despite the dramatic shifts in productivity that had occurred in many countries and especially in Germany and Japan as they recovered from the war. The United States began to have balance-of-payments problems with some countries and was continually shipping gold from Fort Knox to the likes of the United Kingdom and France. Then, in 1971, America accumulated its first trade deficit since 1888, in the amount of $2 billion. In 1972, with gold flowing out of the country like a big yellow river, President Nixon ended the fixed exchange-rate system by removing the dollar peg to gold and allowing its value to be determined entirely by market forces in the global currency exchanges. That resulted in a revaluation of the German mark and the Japanese yen along with other currencies and, for a while, provided relief to U.S. producers and Fort Knox. But by 1980, the U.S. trade deficit was back, and it was not $2 billion. It was $20 billion. Of course, a lot of things had been happening in the world of trade, including the introduction of roll-on-roll-off containerized shipping, the advent of jet travel, and the development of faster communications. In addition, major trading countries like Japan had adopted increasingly mercantilist policies. Free trade theory stipulates that countries should concentrate on producing and exporting what they did best while importing the rest. But Japan and some others chose not to accept that reasoning. As Naohiro Amaya, an architect of the Japanese economic “miracle,” once explained to me, “we did the opposite of what the Americans told us.” He pointed out that the key elements of the miracle model included the protection of domestic markets, export-led growth, government-guided investment in industries with economies of scale (steel, ship-building, autos, semiconductors, etc. ), a managed currency undervalued versus the dollar, and technology transfer as a condition of foreign investment in the domestic market. This was not Adam Smith’s famous “unseen hand,” nor was it free trade as imagined by Anglo-American economists, such as David Ricardo. It was mercantilist “catch up” industrial policy, and it worked so well that it was quickly imitated by Korea, Taiwan, Singapore, and most other developing countries, as well as many developed countries, in various ways (e.g., Germany, Switzerland). The combination of these strategic trade policies plus growing international flows of finance and technology and the impact of international economies of scale negated some of the fundamental assumptions of the free trade system. What a country did best was not necessarily predetermined by resource availability. It could be changed for the better by clever policies. This is what Naohiro Amaya meant when he spoke of rejecting American advice on free trade. He was not in the business of “unseen hands.” He was in the business of picking winners. It was by the government’s picking and strong backing of winners that South Korea (one of the world’s poorest countries in 1960 with no natural resources, no capital, and virtually no skilled labor) came to be a major player in the steel, auto, and semiconductor industries. But the notion of government picking winners and losers with trade policy was contrary to the American suspicion of government intervention as well as to powerful U.S. geopolitical interests, not to mention established academic orthodoxy on free trade. When the U.S. trade deficit hit $50 billion in the mid-1980s, Treasury Secretary James Baker eventually concluded another agreement to revalue the Deutschmark and the yen in 1985. That again eased the pressure of the trade imbalances, but the American economic and foreign policy elite firmly maintained the orthodoxy that more and better free trade agreements were chiefly what was needed to ensure equitable trade. They continued to insist that trading partners were adhering to American assumptions and values regarding how international markets should work. During succeeding administrations, free trade advocates pushed through a string of trade deals—including the Uruguay Round (1986–1994), the North American Free Trade Agreement (NAFTA) in 1994, establishment of the World Trade Organization (WTO) in 1995, China’s accession to the WTO in 2001, the United States-Korea free trade agreement (KORUS FTA) in 2007, and, most recently, the proposed TPP. Not surprisingly, these deals resulted in a steady increase of the annual U.S. trade deficit from $20 billion in 1980 to approximately $500 billion today. Meanwhile, the offshoring of U.S. production continued—not only in labor-intensive industries but also in the capital- and technology-intensive industries in which America is supposed to be competitive. During that time, the gap widened significantly between the top one percent of earners and the rest. However, as the elite persisted in its fixation with orthodox, Anglo-American free trade doctrine, the public and their politicians increasingly developed doubts. For instance, Congress voted 395-7 in support of the Tokyo Round free trade deal of 1979 and 366-40 for the Canada-U.S. Free Trade Agreement of 1988. By 1993, Bill Clinton was able to get NAFTA through the House by a margin of only 234-200 and was unable to obtain new approval for negotiating more trade deals. President George W. Bush was able to get the Central American Free Trade Agreement through the House by only two votes in 2005. The difference between what trade proponents advertised and what actually occurred had become impossible for voters to ignore. Advocates of globalization repeatedly promised that trade would be win-win, that more and freer trade (and investment) would produce more jobs and rising wages even as it delivered lower consumer prices. Although they admitted that some workers might be displaced or disadvantaged, they invariably argued that there would be more winners than losers and that the winners would compensate the losers. In fact, however, as the U.S. trade deficit climbed inexorably, the gap between the top one percent of income earners and the rest also grew considerably. Consumer prices were kept low, but so also were the wages of most earners. The final nail in the coffin of the conventional free trade doctrine’s credibility was the admission of China to the WTO. The Clinton administration argued that it would essentially be a unilateral opening by China, which would have to reduce its high trade barriers, while America would simply keep its low tariffs in place. Analysts predicted that the 2001 U.S. trade deficit of $83 billion with China would drop dramatically in the wake of the deal and that millions of good, new U.S. jobs would be the result. What occurred was quite the opposite. By 2015, the deficit had risen to $370 billion and millions of jobs had been lost while U.S. income inequality continued to rise. Symbolizing the chasm between the promises and results of globalization is the adoption of Xi Jinping as the champion of Davos Man. President Xi and China have never been playing by the Anglo-American rules or assumptions. This is also true of many of the world’s leading and most rapidly growing economies such as South Korea, Japan, Singapore, and Sweden. The failure of America’s elite to learn from experience and its obstinate adherence to a flawed set of theories contributed to the strong campaign of Bernie Sanders for the Democratic Party nomination and the election of President Trump. The overall objective of a new American trade and globalization policy should be to achieve roughly balanced trade over the long term while maintaining a strong, domestically based wealth-producing capacity. Such an approach would mean fully utilizing American human and capital resources, thus reducing or eliminating the inefficiencies resulting from today’s high rate of underemployment. U.S.-based producers, as a result, would enjoy higher profits which, in turn, would stimulate greater investment, R&D, and skills training. By eliminating the chronic trade deficit, balanced trade would lead to increased economic growth as domestic production supplied not only more of domestic demand but was also bolstered by growth in newly competitive exports. America would be able to stop borrowing abroad to pay for what it could produce domestically at competitive prices if exchange rates were properly established. Balanced trade would also mean more revenue for the U.S. government, even under a reduced tax rate regime, lower expenditures on both corporate and individual welfare, and smaller budget deficits. Moreover, research from former World Bank economist John Hansen indicates that balanced trade results in more equal patterns of domestic income distribution. Thus, fewer Americans would feel as if they are being left out of the American dream. The most important step toward establishing balance must be to establish an exchange rate system that fairly and continually reflects roughly the true value of the range of global currencies. To this end, the U.S. should reverse the Commerce Department’s policy of not applying countervailing duty remedies to currency subsidies. At the moment, the Petersen Institute’s C. Fred Bergsten estimates that a 25% tariff is levied on foreign imports of all American goods and services while a similar amount of subsidy is provided for all exports to America by the chronic overvaluation of the dollar. Not only would adjustment of this overvaluation contribute greatly toward achieving balanced trade, but it would also simplify negotiation of other elements of trade. Rules of origin, tariff rate adjustment, and rules for judging whether dumping is occurring would all be simpler to negotiate and of less importance if exchange rates were properly set and adjusted. Or consider interest rates: the Fed has been reluctant to raise rates, in part, due to fear that doing so could strengthen the dollar, increase the U.S. trade deficit, and thereby cause a slower recovery. The creators of the postwar global economic system understood that before they could even speak of trade, they had to establish a sensible currency system that would tend to keep trade roughly balanced. In view of the failure of that system and the subsequent floating rate system, a new one must be developed. For the time being, the dollar may remain the principal global reserve currency, but U.S. trade must also remain in rough, long-term balance. In order to achieve such a balance, costs must be imposed on countries that accumulate chronic trade surpluses, as John Maynard Keynes recommended back in 1948. One efficient way of doing this would be to adopt a currency corrective such as the Market Access Charge (MAC) system, as Hansen has argued. This system can be thought of as a kind of “peak load pricing” mechanism similar to those used by electricity utilities, airlines, rental car companies, and hotel operators. At specified points, a charge would be imposed on capital investment entering the United States. For example, suppose the U.S. trade deficit exceeded one percent of GDP over the preceding twelve months. That would trigger automatic imposition of a MAC of, say, 50 basis points on the value of incoming foreign capital. The rate might increase if the deficit became larger or persisted for another six months. Of course, the rate would decline as the trade deficit declined so that it would again be zero once the trade deficit fell below one percent of GDP. The system would essentially be automatic and would be administered by the Fed. A set rate for all capital inflows would discourage short-term speculation. But because such investment comes only once, stays put, and yields higher returns than speculative flows, it would impose only a minuscule burden on direct foreign investment. The charge would be collected electronically and automatically by the computer systems already existing in the banks that handle most cross border U.S. financial transactions. The funds would be transferred to the U.S. Treasury where they would be deposited into an American International Competitiveness Account (AICA) that would be dedicated to investment in R&D, the National Network for Manufacturing Innovation, worker training, adjustment assistance programs. Such funds could also be used for infrastructure development, to offset costs associated with the enforcement of trade agreements, and to offset any increased costs of borrowing linked to MAC charges on the purchase of government debt obligations. Because the U.S. trade deficit is a well-established and easily available objective statistic that directly reflects the misalignment of the dollar, it points to an easier path for identifying foreign currency manipulation. Currently, the designation of a foreign country as a currency manipulator depends on the difference between the market exchange rate and the “fundamental equilibrium exchange rate.” Under the MAC system, there would be no pejorative element in assigning the “manipulator” label, and thus there would be no need to consider a particular country’s strategic importance to the United States in taking action to balance trade. Furthermore, the MAC would be completely in accord with existing IMF and WTO rules and would act to reduce the number and intensity of anti-dumping and other trade disputes being adjudicated by that body. The second major problem for the United States in the current global system is that of American foreign investment and the so-called offshoring of production and jobs. Often, countries with strategic economic policies use investment incentives as a way of causing the transfer of production from other countries to themselves, even when the original countries were perfectly internationally competitive. Destination countries may not have lower actual operating costs, but they may waive taxes for ten or twenty years, or provide free land for production and office facilities, provide utilities at a reduced rate, provide capital grants, and so forth. State benefits such as these have nothing to do with so-called comparative advantage and everything to do with indirectly subsidizing production in order to shift the location of comparative advantage to the sponsoring country. Although there is nothing illegal about this under WTO and IMF rules, it is at odds with the whole notion of competitive markets. The United States is half in and half out of this game. It does not play at the federal level, but the individual states do play. Washington does not offer special benefits to, say, BMW, in order to persuade it to locate an auto assembly plant in the United States. But the state of Alabama or South Carolina may do so. The difference between these local benefits and an offer of investment benefits by another country like Ireland, Singapore, or France is that U.S. states simply do not have the resources or authority to make the kind of big offers that a national government can. For instance, Alabama cannot offer to suspend federal corporate income taxes nor does it have the resources to make the same kind of capital grants as a nation state. The United States, consequently, tends not to do as well in the game of attracting foreign direct investment and transfer of production as some other countries. Over time, this has the effect of creating a structural trade deficit for America and erasing what should be its natural centers of training and production. On top of this, U.S. corporate tax rates are the world’s highest, and the United States is one of only two countries in the world that taxes the overseas earnings of its domestically incorporated companies. Thus GM pays U.S. taxes on its earnings in Germany, but BMW does not pay German taxes on its earnings in the United States. As a result, the big accounting firms make a bundle by dreaming up schemes with names like the “double Irish” and “Singapore Sling” to enable global U.S. corporations to hoard earnings in tax shelters abroad rather than investing in productive activity in America. There are actually rather straightforward solutions to these problems. One is to stop taxing the foreign earnings of U.S. corporations, and the other is to reduce U.S. effective corporate tax rates from the current 39 percent to somewhere between 15 and 20 percent. This may look like a big tax cut for the global corporations, but as a practical matter, it would actually increase tax revenue by negating all the tax avoidance schemes that now keep actual (as opposed to potential) corporate tax revenue at very low levels. A move by the U.S. in this direction would put enormous pressure on virtually all other countries to adopt similar rates. Washington should, therefore, use this kind of a tax law shift to negotiate a global agreement on corporate tax rates under the WTO. The second solution is for Washington to establish a war chest with which to respond in kind to the investment incentive offers of other countries. There is precedent for this. In the late 1980s and early 1990s, the United States countered foreign export subsidies by creating a fund and striking back in kind. Simultaneously, Washington led an initiative for a global agreement limiting export subsidies that eventually was adopted as part of the creation of the WTO. Exactly the same kind of effort is now called for to solve the problem of investment incentives. A third issue of this kind is that of investment driven by conditional market access. Some countries effectively pressure global corporations to transfer technology and production to them as a condition of market access. Of course, this is not a matter of law because any such law would be illegal under WTO rules, but it is a matter of practical and political reality. Washington should closely monitor investment in such jurisdictions and apply counterpressure when conditional market access measures are detected. Such counterpressure could include the withholding of certain export licensing permits on high technology relating to national security, or quid pro quo measures imposed on the corporations of the country in question. Another major tax issue is that of value-added taxes (VAT). Although the United States does not have a VAT, almost all of its trading partners do. A VAT works by imposing a tax on the value added to a product or service at each step of production. Typically, it amounts to about 20 percent of the end value of the product. In effect, it is a kind of sales tax that is generally rebated to the producer on exports and imposed on imports. Instead of a VAT, the United States imposes an effective tax of about 39 percent of corporate income on American companies. Under WTO rules, this kind of a tax cannot be rebated on exports or imposed on imports. While other countries also have corporate income taxes, the rates are usually much lower than those of the United States. Thus, in practice, the VAT imposed by foreign countries tends to function as a kind of tariff on imports from the U.S. while their VAT rebates function as a subsidy for exports. For years, Washington has tried to persuade its trading partners to accept various remedies, but all to no avail. Since it cannot beat its trading partners in this arena, Washington should join them. The United States should adopt its own VAT system. Not only would this be a major step toward balancing U.S. trade and creating increased investment and jobs in America, it would also raise domestic revenue and be a major step toward balancing the federal budget. The U.S. might also consider unbinding specified import tariffs. Immediately raising any tariff could give rise to outcries of “trade war,” counter-threats, and eventually legal retaliation. By contrast, simply unbinding tariffs could open the door to a series of renegotiations of multilateral, bilateral, and regional agreements without any immediate downside. In this way, the U.S. could redress specific grievances (such as Canadian dairy protectionism, back-door imports of third country beef cattle, and inadequate protection of intellectual property), raise existing legal standards (e.g., on labor, health and environmental standards, industrial subsidies, and the functioning of state-owned enterprises), and, for the first time, achieve effective, enforceable restrictions on issues such as currency misalignment. Another part of this trade and globalization reform package would be a program to deal actively with the excess capacity and dumping that inevitably arise from the industrial and export led growth policies of key U.S. trading partners. The U.S. secretary of commerce should initiate investigations under Section 232, the national security clause of the trade law, to determine when U.S. industries are being damaged by global excess capacity and should impose charges to halt such activity. At the same time, the secretary should be actively negotiating with the countries having such policies to restrain new investment in industries already suffering from gross excess capacity—such as the steel industry, in which China alone has enough capacity to supply most of the world’s needs. In extreme situations, the U.S. could declare an emergency under the International Economic Emergency Powers Act. This approach would involve setting targets for a reduction in the U.S. current account deficit (perhaps on a semiannual basis) and authorizing the application of import tariffs in the event that the targets are not met. Finally, there is the issue of foreign investment in the United States. In principle, investment is a good thing that creates jobs, rising productivity, and technological advance. But investment can also be predatory. It can be used by state-owned or guided enterprises to strip out technology, transfer production, and shift so called comparative advantage. The Committee on Foreign Investment in the United States should carefully monitor foreign investment from countries or corporations with significant industrial policies and state influence over investment to prevent any such predatory kinds of investment. Together, these measures would dramatically change the course of America and of the world. They would greatly increase the growth, productivity, and dynamism of the U.S. economy. They would also end the dependence of America on continued borrowing from China, Japan, and other countries. In short, the United States would become richer, more secure, and more independent. 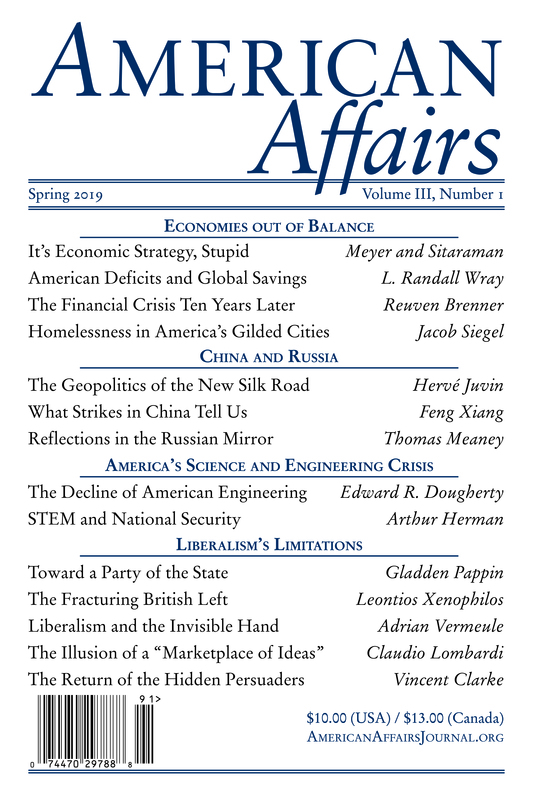 This article originally appeared in American Affairs Volume I, Number 1 (Spring 2017): 50–61. Clyde Prestowitz is the president of the Economic Strategy Institute and the author, most recently, of The Betrayal of American Prosperity. He served as counselor to the secretary of commerce in the Reagan Administration and as vice chairman of President Clinton’s Commission on Trade and Investment in the Asia-Pacific Region.